When it comes to food, I prefer variety. There really isn’t too many food items that I would consider eating on a daily basis, but I can say that yogurt seems to make the list. 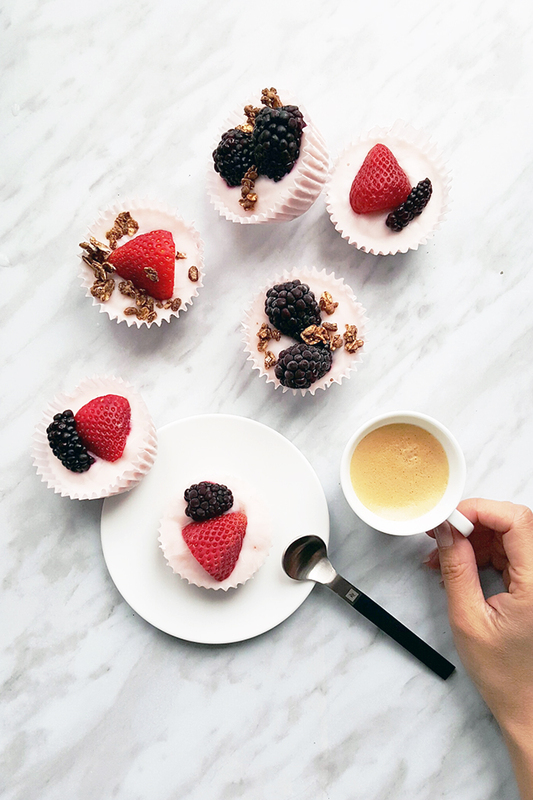 Whether it’s preparing breakfast parfaits, fruit milk shakes, or a photo-worthy smoothie bowl, I love combining my favourite yogurts into these recipes. With the warmer season fast-approaching (one would hope! ), I wanted to create a frozen yogurt treat that was not only healthy but tasty while satisfying my sweet tooth. 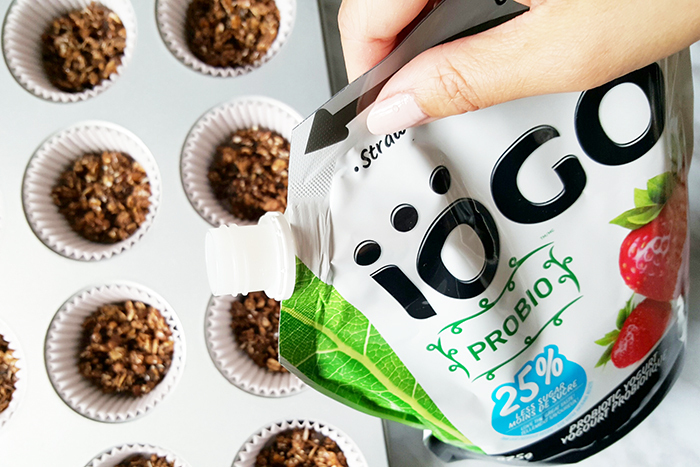 I was recently introduced to the new IÖGO pouches large format and I’m so impressed with it. These large pouches are perfect for me because I go through so much yogurt on a weekly basis. 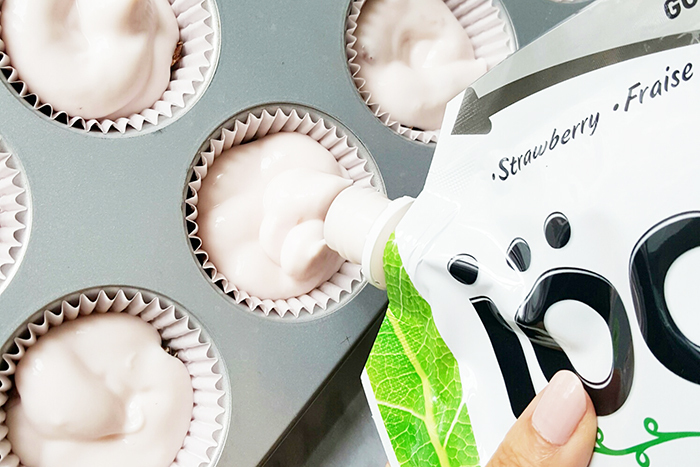 The pouches are extremely practical and prevents any mess and spills. 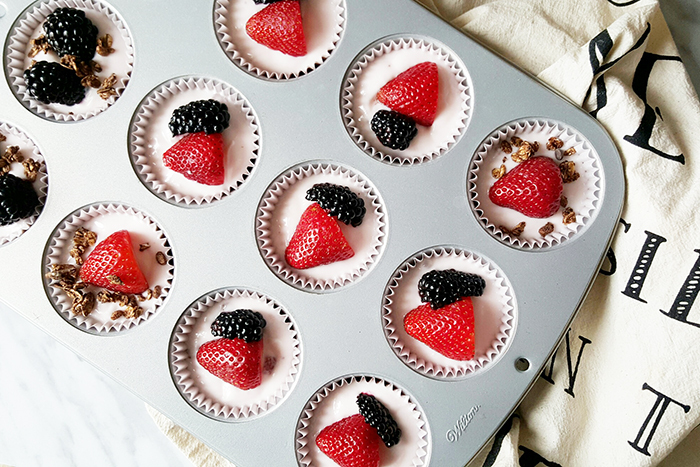 I promise you, these frozen fruity yogurt bites will take you less than 10 minutes to prepare and ready to enjoy once they’ve had some time to cool off in the freezer. Read further for the full recipe. 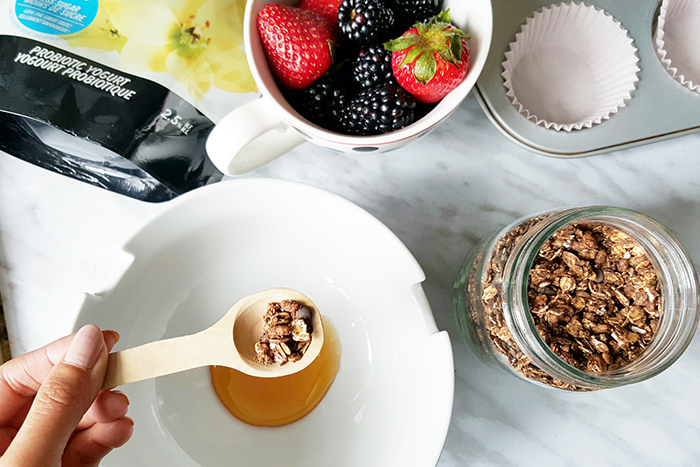 Step 1: Mix granola with honey to create a sticky mixture. This is totally optional. 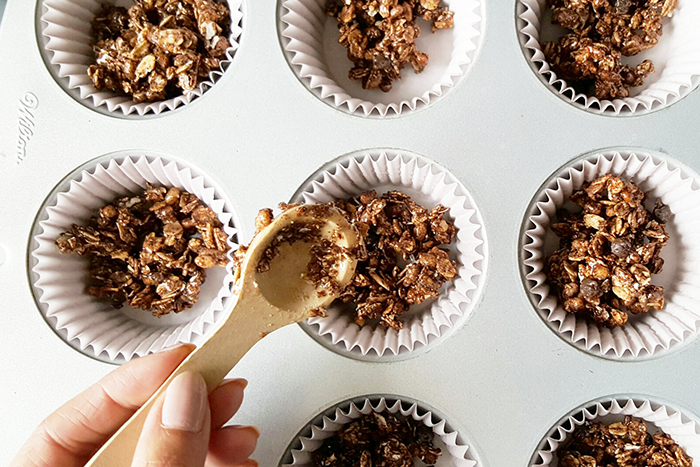 Step 2: Line muffin tray with paper liners and divide granola mixture evenly on the bottom. Press granola mixture firmly to create a crust. Step 3: Uncap the yogurt package and fill each muffin tray about three quarters high. 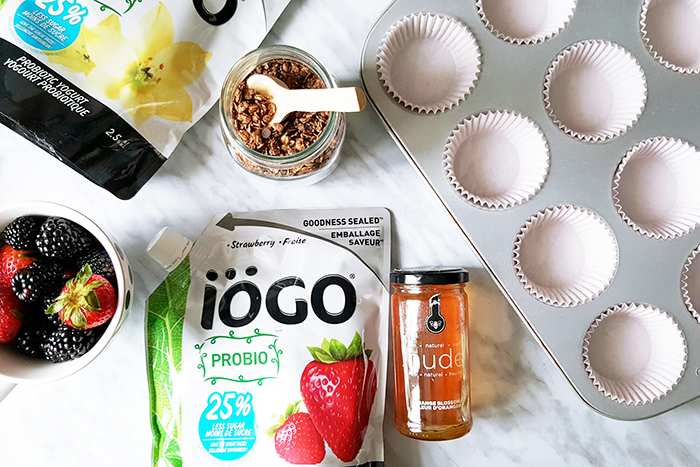 I always found that using a spoon to prepare my yogurt recipes were so messy and that’s why the new IÖGO pouches large format is perfect. 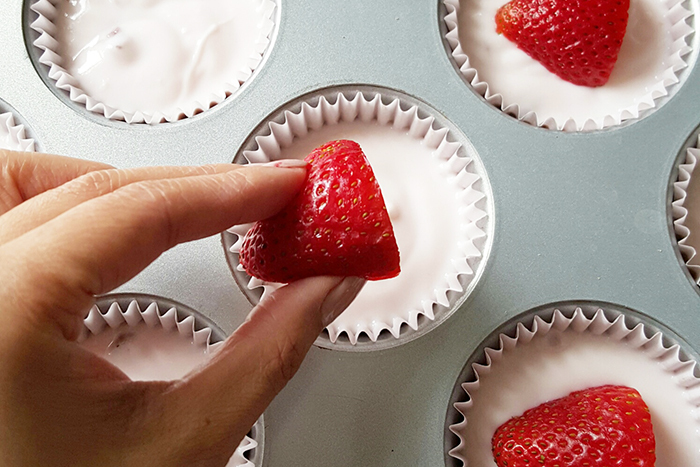 It allowed me to squeeze as little or as much yogurt into each muffin tray without creating any mess or spills. I also love the fact that it comes with a resealable cap that’s perfect for storage. Step 4: Decorate with favourite fruits on top. Step 5: Sprinkle additional granola as desired. Place in the freezer until yogurt has harden, about 2-3 hours. Enjoy these with a cup of coffee or espresso! They are healthy, tasty, and so cute! 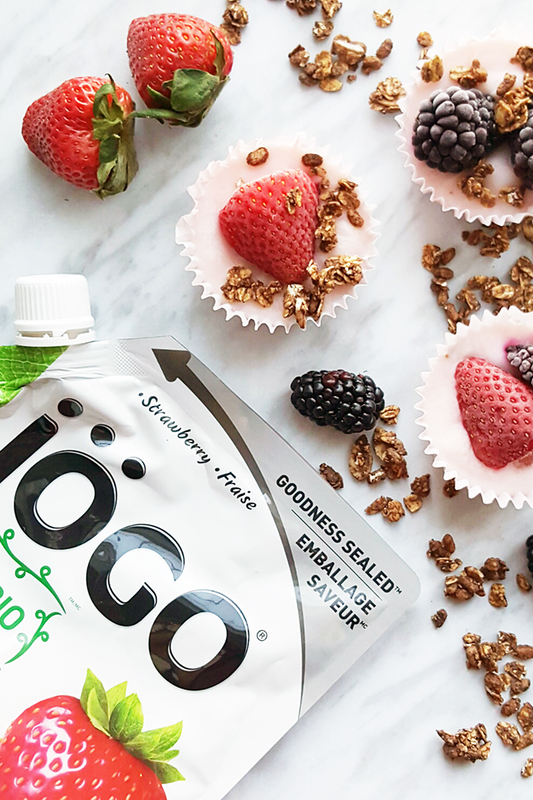 IÖGO large pouches format comes in three different ranges – Original (975 g) & Probio (875 g) in Vanilla and Strawberry and Greek (750 g) in Vanilla 2% & Plain 0%. Try them in your next smoothie or as a topping to your fruit bowl! New pouches available in most grocery: Loblaws, Metro, Food Basics, Sobeys, FreshCO, Longo’s.